Colombia’s capital, Bogota, is a sprawling urban center. 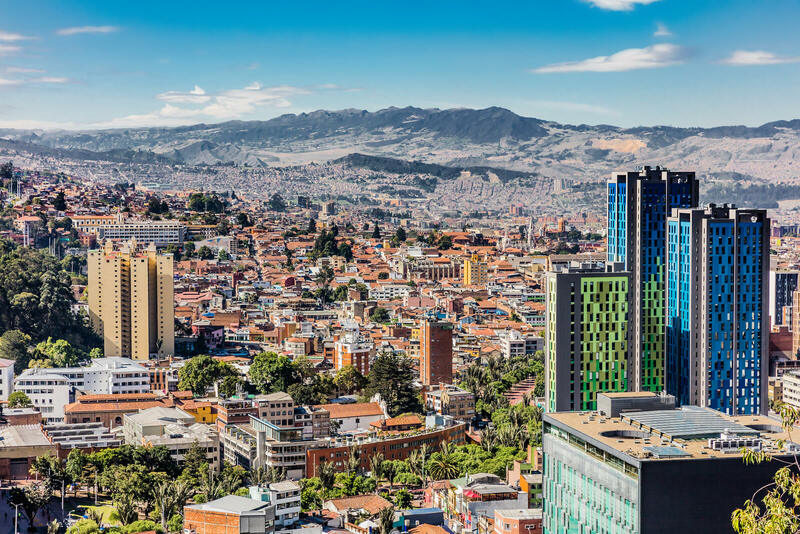 Bogota is home of famous museums, including the Museo Botero and the Museo del Oro, old cobblestones neighborhoods, such as the Candelaria with buildings dating from the years of the Spanish colonization, and an exciting night life. The second most famous city in Colombia, Medellin is enjoying a modern and safer present and looking forward to a promising future. Visitors can take a peek into its history by taking a tour of the 13th District, the place where some of the drug battles took place. You can see how the locals are reshaping their lives and inspiring the youth to dedicate their talents in the pursuit of the arts. Caldas, Quindio and Risaralda make the triangle in the rural region of Colombia. The Coffee Region is known for the production of some of the best coffee in the world, for beautiful rolling green landscape, the tallest wax palm trees and the impressive El Penon de Guatapé. With its majestic glaciers and snow-capped peaks, this is a great destination for the adventure seekers looking for an extra challenging hike. It is high in the Sierra Nevada Mountains with areas reaching 17,000 feet of elevation.